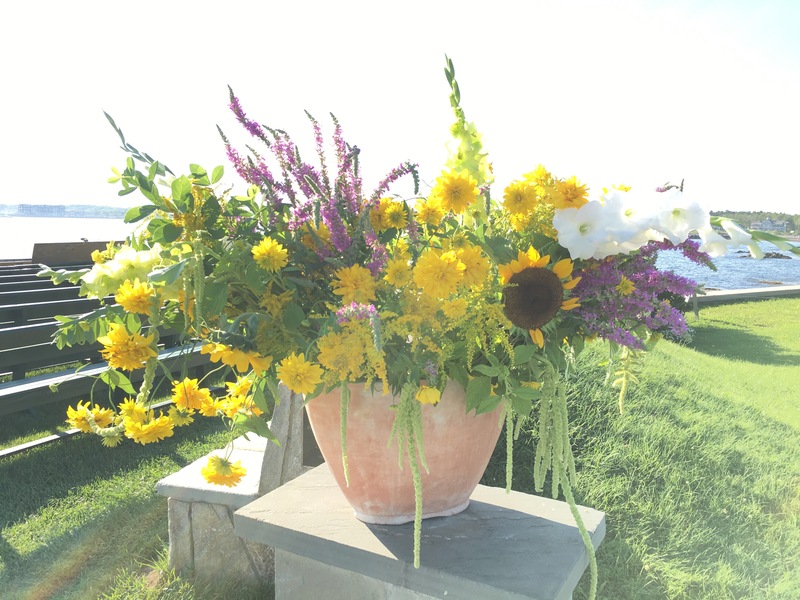 For those of you who are not weary of me yammering on about my short career as a florist, I come round one last time to share more photos of my big adventure growing the Flowers for Emily Sheehan and Charlie Carey’s wedding on August 6th in Kennebunkport, Maine. Emily is the third child in our family, but she was the first Sheehan to be born here at the farm. From the start she loved Flowers, frogs and chickens. 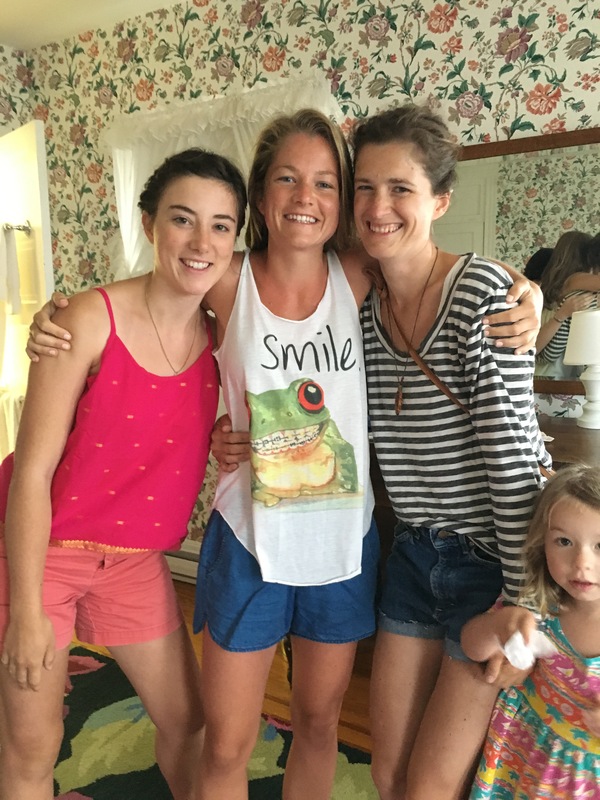 In fact, here she is remembering this love of frogs on her wedding morning while breakfasting with Sarah, Elizabeth and Grace! With Flowers, Emily especially liked to pop the blossoms off the plants. By age three she was an expert at this. With the chickens and frogs, she was more delicate. No chickens or frogs were ever loved to death by Emily, though with some baby chicks, it was a close call. When Emily and Charlie got engaged in August of 2015, I signed on to do all the Flowers. 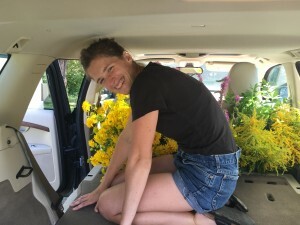 Emily has spent a zillion hours in the gardens here and during almost all of these hours she had made the switch from Flower decapitation to weeding, watering and otherwise loving the Flowers in a productive way. 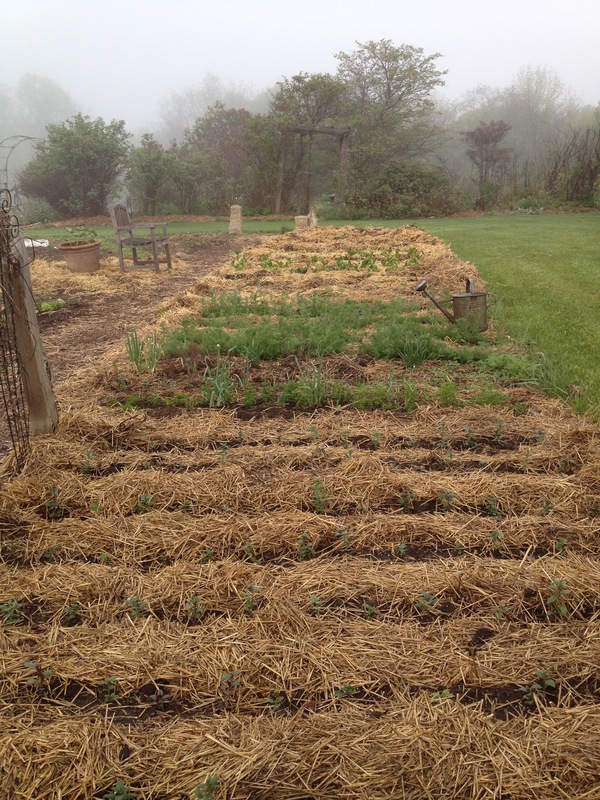 She is particularly adept at bindweed removal which makes her a hero of mine. The Flowers and I love her. It was the least we could do. So when I went to plan the gardens with the Angels this January, cut Flowers were the focus of all the gardens. 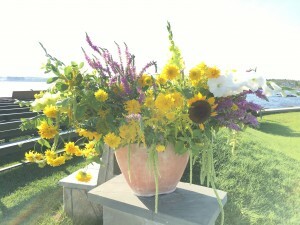 By then we knew the wedding would be in August and that we would be transporting the Flowers from here to coastal Maine. 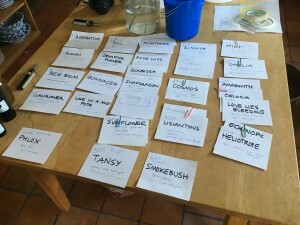 As I worked out the garden designs, got the seed orders in and began to plant the seedlings that would one day be in her bouquet, I took time to send her alarming photos of what I had planned for her. 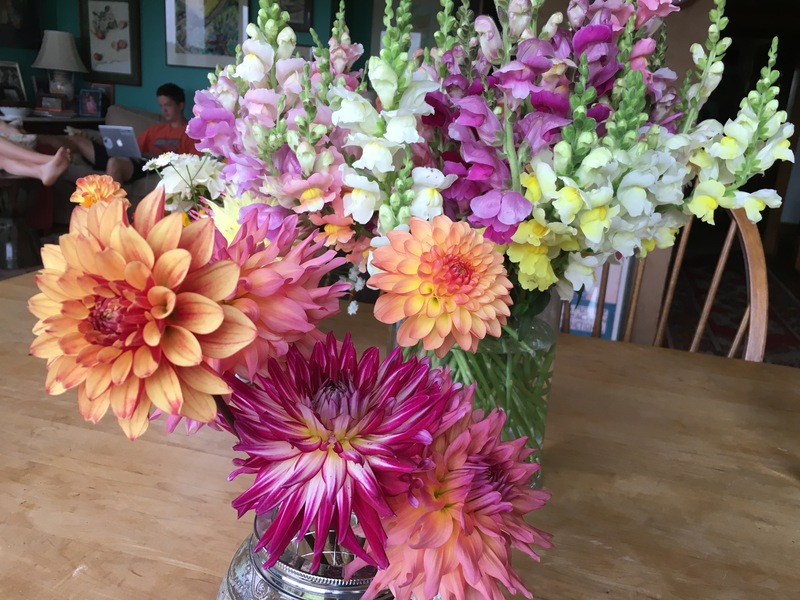 Emily loves Dahlias so we went for it with this family of Flowers, ordering from various random places I found online. 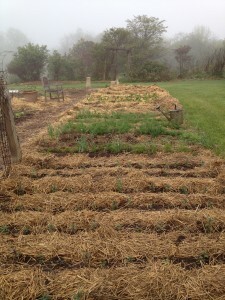 We dedicated the hoop house to Dahlias and Lisianthus. 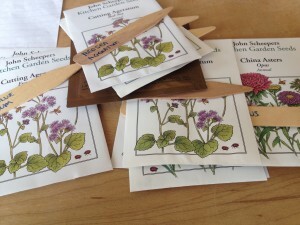 As I filled the greenhouse with seedlings then planted hundreds of baby plants out in the gardens, I tried to plant things at the right moment so they would be in bloom the first week in August. 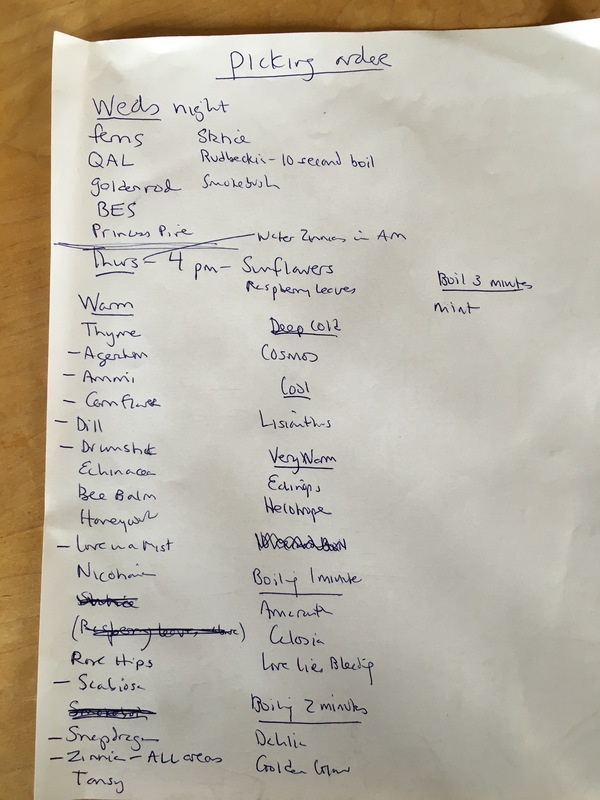 One day William looked at my time tables and noted a major computation error that had me thinking I had ten more days than I actually had. 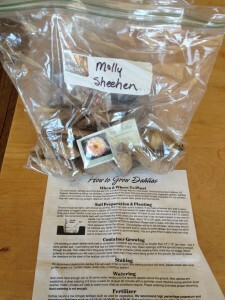 After some teeth gnashing, I raced out into the dark gardens and planted Sunflowers. I could only hope that those bloom times I had built my planting schedule around were not an exact science. Mercifully the Sunflowers and most everything else delivered their blossoms at the right time in time in spite of my poor math skills. 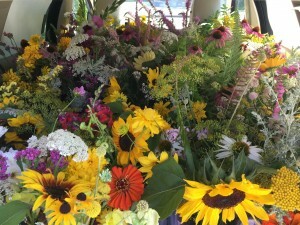 THANK YOU EVERY LAST ANGEL AND ELEMENTAL AT GREEN HOPE FARM! Ironically I am married to a math teacher. Unfortunately in 38 years of marriage this talent for numbers has not rubbed off. Some plants bloomed early and often. 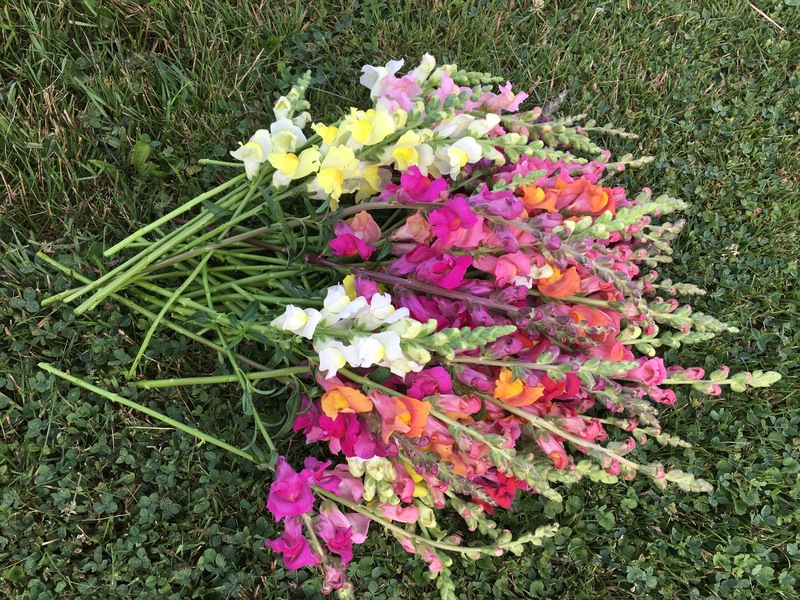 We especially loved the Snapdragons which we had to keep cutting so they would keep blooming. We had two high school gentlemen, Rex and Jay, working in the office this summer. When I began to send all the staff home with daily bouquets, they got serious brownie points with their moms. My only rule was that they had to return the previous day’s vase before I gave them the next bouquet. We were seriously hoarding vases and I knew we needed at least 25 for the table arrangements. 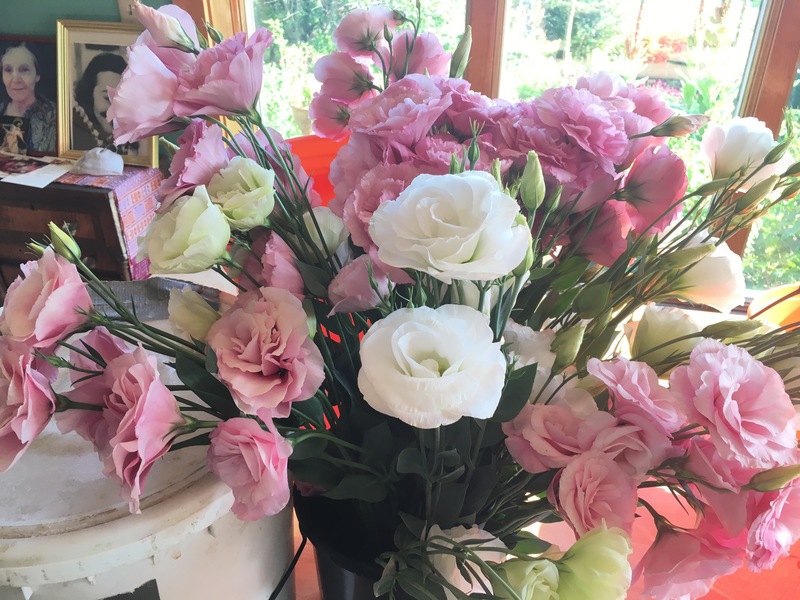 As I reported previously, I read a lot about conditioning cut Flowers so they would stay fresh for the maximum amount of time. 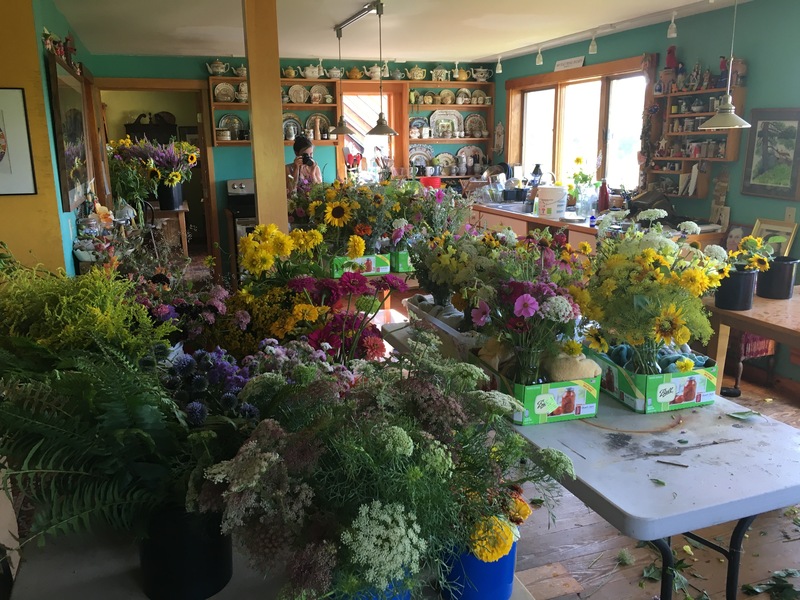 As things began to blossom, we covered every flat surface in the house with Flowers that were being tested in various temperature waters with various different floral preservatives. We made flash cards for every Flower we were growing so we could note how our experiments had turned out end note how to preserve the Flowers the week of the wedding. The Flowers that preferred to have their stems boiled before being put in water were our least popular Flower friends. 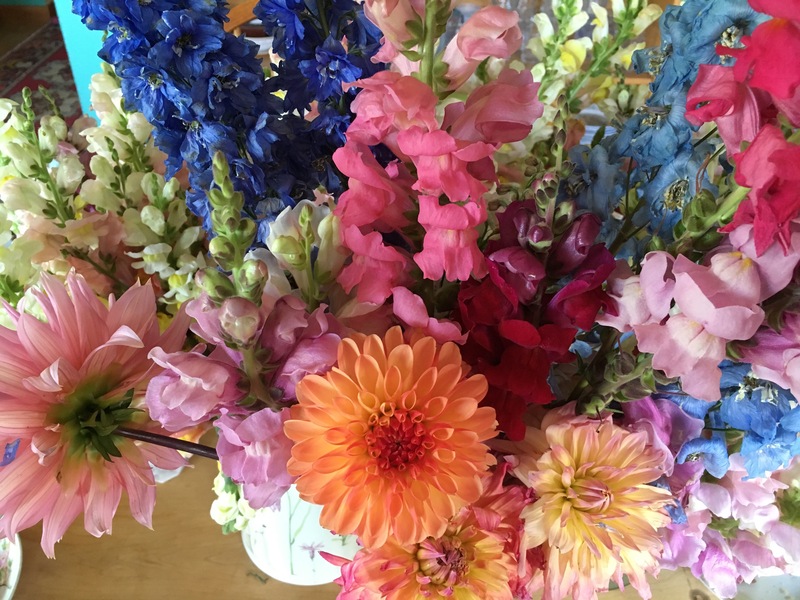 One adventurous evening as I sat surrounded by many, many quart jars of Flowers in hot, warm and tepid water, I grabbed what I thought was my quart jar of Flower Essence water and took a mighty glug. And I mean mighty- as in at least a cup of water glugged down fast. YIKES! What a horrible taste! I had just drunk floral conditioning water. Silently, so as not to alarm the menfolk who already thought we were NUTS, Sarah and I went off to google if floral conditioner was a poison that necessitated vomiting or a late night trip to the poison control center. Thank goodness, floral preservative water is nontoxic. Apparently I could even have finished off the quart jar of the stuff. Later we would comment frequently that my run in with floral preservative had given me stamina for the whole floral endeavour. 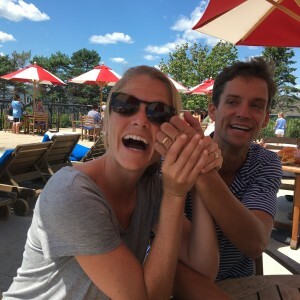 A few weeks before the big pick, Sarah had a friend getting married. 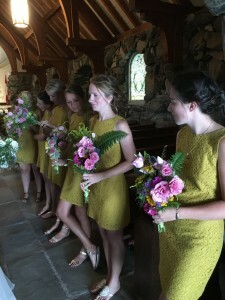 Sarah offered to do the Flowers for her friends much smaller wedding. 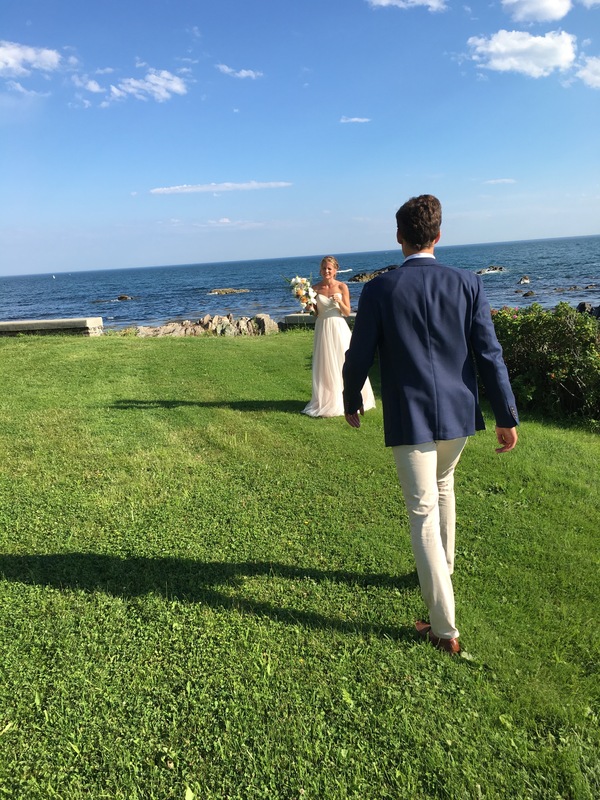 This gave us a wonderful warm up for August 6th plus we were so happy to share our enormous crop of Flowers with another bride. 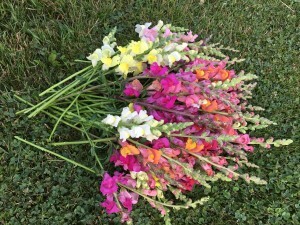 One thing we learned as we got the Flowers ready for this first wedding was that the 45 youtube videos, blogs and books sharing how to assemble a bouquet that we had poured over were not helpful. 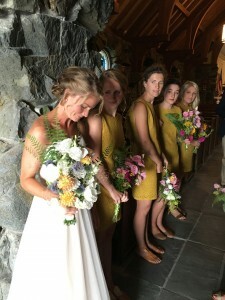 Using the technique everyone offered up, all the bouquets looked like round blobs. 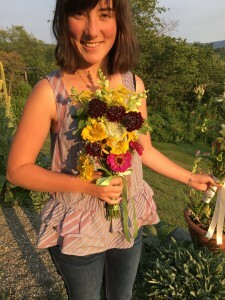 In the eleventh hour before her friend’s wedding, Sarah came up with a technique to lay the bouquet Flowers flat on a table fanned out as we wanted them to appear in the bouquet. After we were satisfied with the arrangement, floral tape was wrapped around the Flowers so that there was a clear front to the bouquet and an obvious backside that sat comfortable against the bride or bridesmaids. 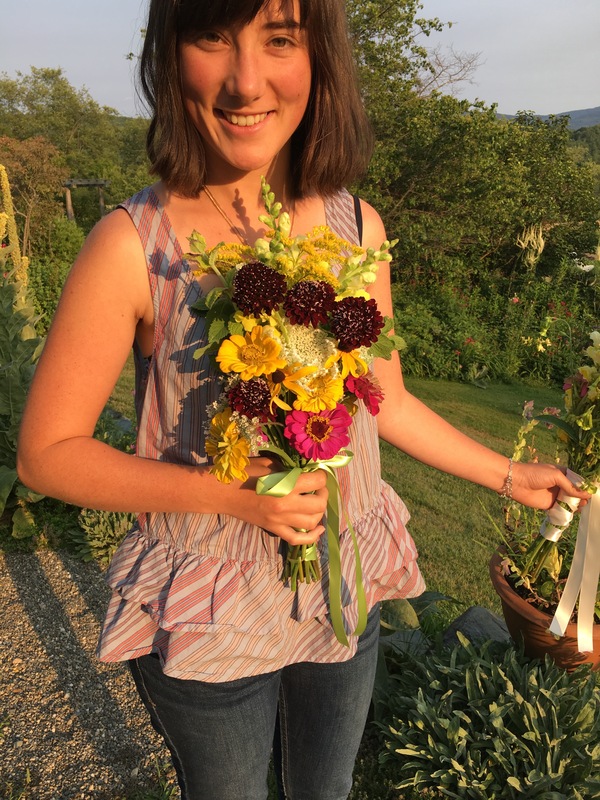 This innovation made a HUGE difference and many of the bridesmaids in Emily’s wedding told us this way of arranging the Flowers was MUCH more comfortable to hold than the circular bouquets they had held in other weddings. Here is Sarah holding up a sample of this technique. Note how I have framed the photo to cut off the top of Sarah’s head. 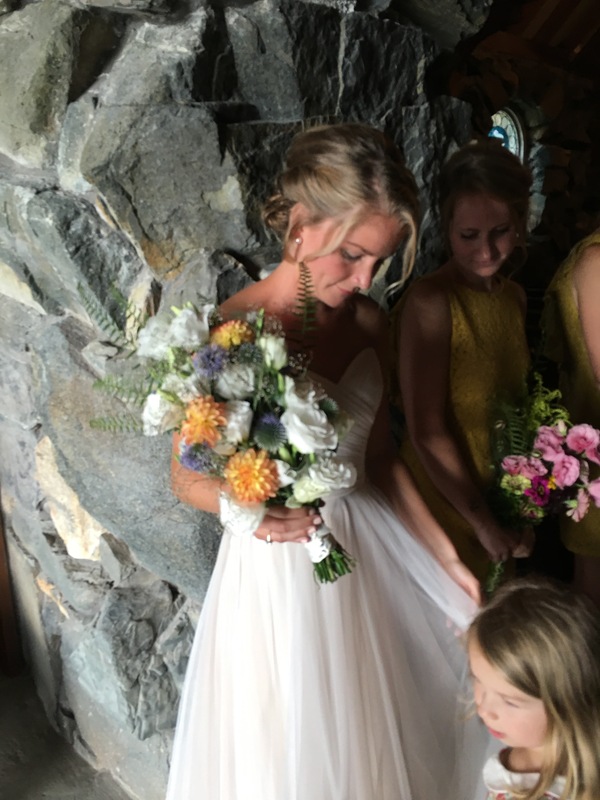 Yup, not paying attention to anything but the Flowers….. 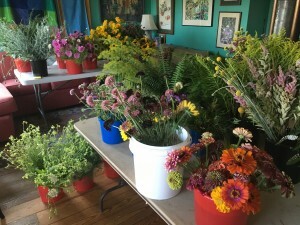 Finally, it was August and the week of the big cutting. 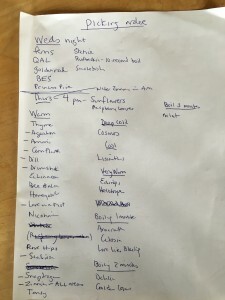 This was my cut list (sort of- I ended up cutting more that this, but this list gives a sense of what we cut). Also I had our flash cards at the ready. Am I boring you yet???? Because Sarah and I bored everyone this summer. I think we even bored the bride. By the end of the second day of cutting, our downstairs was completely full of Flowers. We sent the Sheehan men to Maine to play some pre-wedding golf so we could get them out of our hair and not have to think about things like food or speaking to them about things other than Flowers. In the scene above we have just begun to pick. 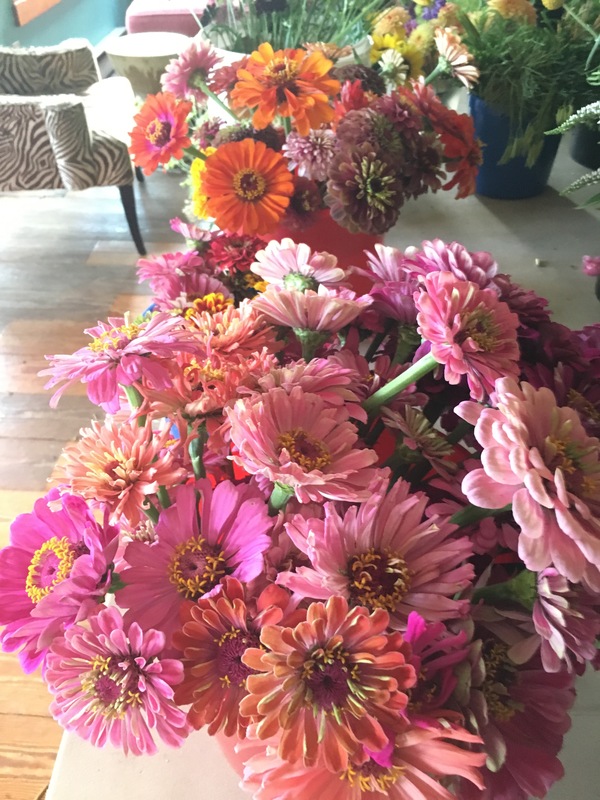 We expected the Zinnias to be astounding and they were. These were the ones set aside for the bride. Though it would be Lisianthus we would end up leaning on for her bouquet, especially the white ones. 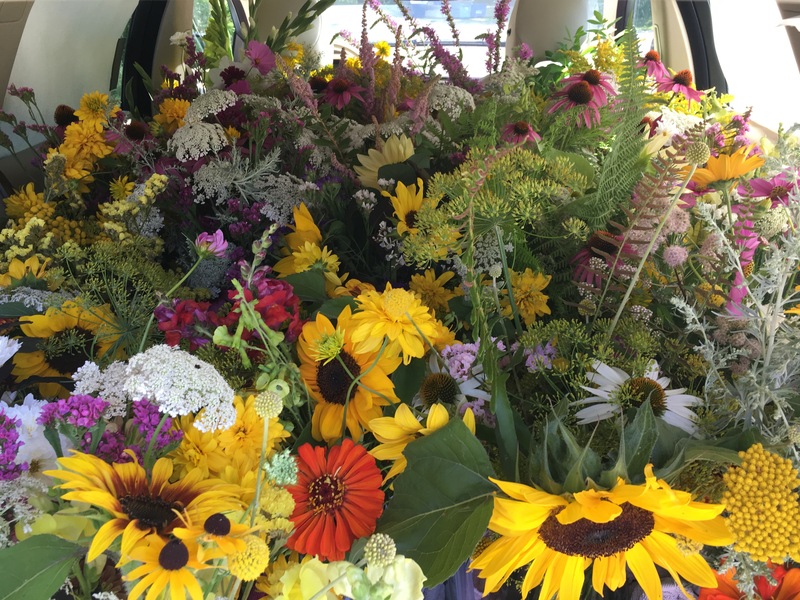 As this photo was taken, we had just made the 25 arrangements for the tables at the reception, and we are about to load them into the cars along with the loose Flowers for other arrangements, boutonnieres, corsages and bouquets. Sarah is taking (a no doubt better) photo of the room. 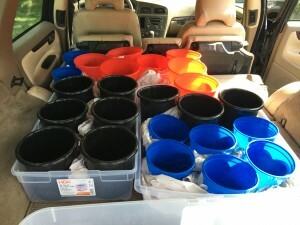 Sarah (the heroine of our story) ran the convoy to Maine like a military operation. We practiced loading each vehicle with empty buckets the week before. 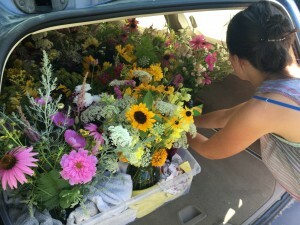 The day of, Sarah stayed in the house handing off Flowers in proper loading order and Lizzy and I put them in the cars. After making sure everything in the house was transferred to a car, Sarah came out to make sure everything was packed in securely. I particularly liked the view across this group of arrangements. 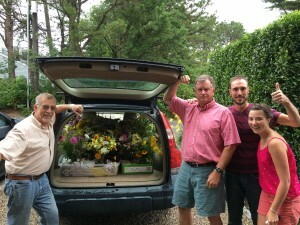 Arriving in Maine we leaned on the well rested men to transport Flowers hither and yon. 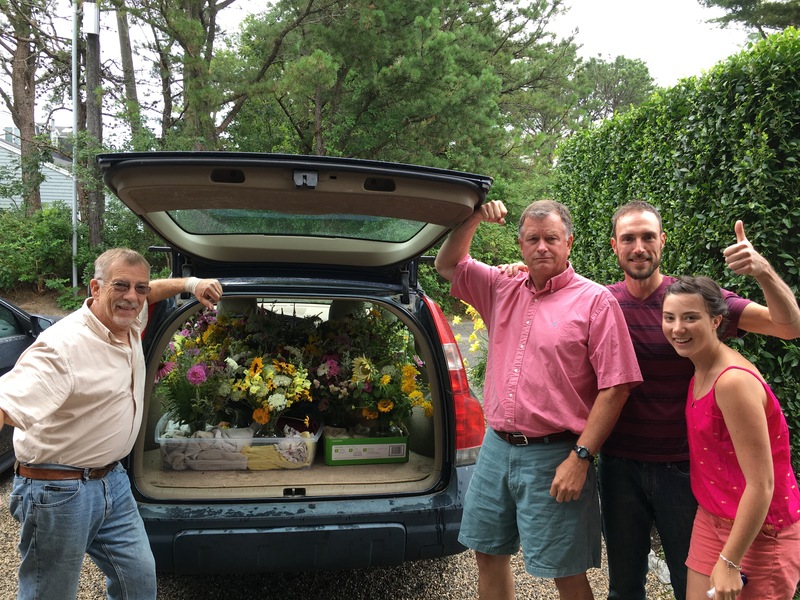 This is a shot of Michael Dutcher, Jim Sheehan, Nick Lamper and Sarah flexing their Flower moving muscles. Sarah didn’t linger long in front of the camera as we still needed to assemble the 12 bouquets, 14 boutonnieres, 6 corsages as well as the big pieces for the outside area where the wedding took place. This is one of the two big pieces that the men later had to move from the outside amphitheater where the wedding took place to the reception. Below, the men stuff these enormous and heavy planters into a car moments after the ceremony. No doubt this job was bringing home the truth that a wedding can’t all be golf and champagne toasts. 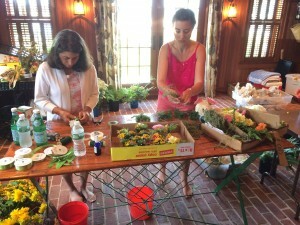 Here Green Hope goddess and former staffer Catherine Boorady works with Sarah on the boutonnieres. 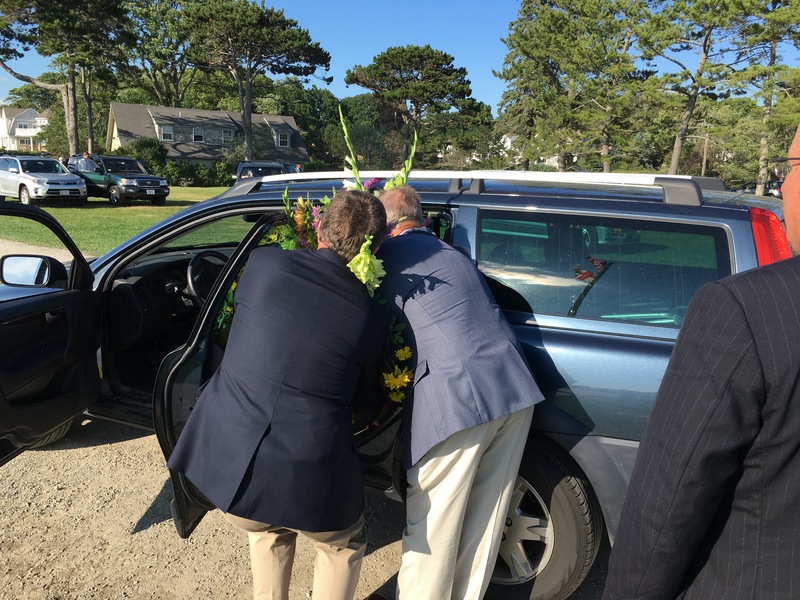 By the time we got to the bouquets, time was getting short and we took no pictures. Emily has not gotten any official wedding photos back, but I did get a few photos as we waited inside the church before our walk to the lovely spot by the sea where the wedding took place. 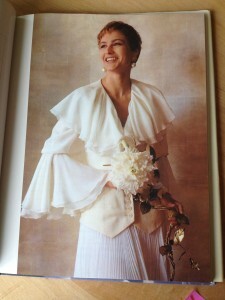 Here is Grace, focused on sticking to the bride like gravy on rice. Just a few minutes later, Grace did a fabulous job walking down the aisle as a Flower girl and sitting very quietly throughout the service. 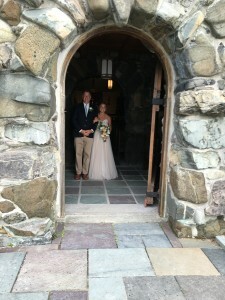 Here is Em coming out of the church to go across a beautiful expanse of lawn to the sea. Moments after this was taken, a wild wind and accompanying thunderstorm rolled in and rained on all of us for a few minutes. We all laughed, and then the sun came out. What a magical moment! 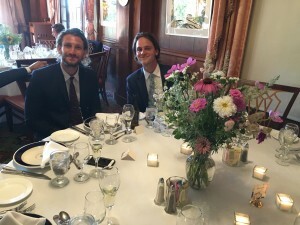 At the reception, we admired all our Flowers and met lots of Charlie’s family. This duo hailed from Australia. They thought we were taking their photo, but really we were just admiring one of our bouquets! It was a very wonderful and Flower filled event. We are so happy to officially welcome Charlie into the Sheehan family. He can count on lots of Flowers in his future and lots of strange job assignments too. Fortunately Charlie loves Flowers and accompanying farm jobs. In fact this final shot is of Emily and Charlie just as they set off on their honeymoon to northern Maine where they explored lovely gardens including Asticou.